This is a reflection upon yesterdays opening of the Boston Apple Store, located on Boylston Street. theiLife.com correspondent Adam Epstein helped cover the opening by providing video, picture and text updates; and has retold his adventure below. 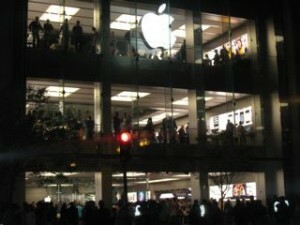 The opening of the Boylston Street Apple Retail Store was the second event at an Apple Store that I have attended. The first was the release of Leopard in fall 2007 at the Burlingame, CA store. I was not able to leave work in Worcester until close to 4:45 p.m., and I knew I would be cutting it close with the 6 p.m. opening in Boston. I parked at the Prudential Center and made it to the line at about 5:40 p.m. I had two friends already in line in two different places. My place in line was on Fairfield Street further away from the store than Newbury Street. The street was sectioned off with barricades, and the line width was anywhere from 5-8 people stretching several blocks and then onto Boylston Street approaching the store. It was hard to estimate the number of people in line, but having heard in advance that there were only 1,000 t-shirts, I definitely did not think I would get one giving my place in line. I was snapping photos with my camera and iPhone, and sending updates. Just before 6 p.m., my e-mail and internet on my iPhone stopped working, and I was getting a “cannot activate EDGE” error. It continued for nearly 35 minutes (frustrating!) even with several restarts of the phone. It eventually came back. Meanwhile, it seemed like every third person had an iPhone. Other than my time at Apple headquarters in Cupertino, I don’t think I have been in a place with a higher iPhone concentration. Shortly after I arrived and about 10–15 minutes prior to the store opening, the employees (what seemed like all of them) began running along the sidewalk adjacent to the line cheering, screaming, and high-fiving the people in line. There was a significant police presence for traffic and crowd control. The television news vans for the local CBS, NBC, and FOX affiliates were stationed on Fairfield and Boylston Streets. At several times, a helicopter was hovering overhead; whether it was for this event or just standard Boston traffic, I don’t know. Some pedestrians passing by on the sidewalk were asking people in line what they were doing there and what they were giving away for free. Eventually the line began to move (slowly!) with the security staff allowing small groups of people to cross the streets at a time. I was receiving text message and phone call updates from my two friends already inside describing the store and asking where I was in line. They said it appeared that there were still plenty of t-shirts as I was getting closer to the store. They also said there were Red Sox people (they didn’t know who) inside. I made it to the front of the store at about 7:10 p.m. still with quite a significant line behind me. Finally it was my group’s turn to enter. As we entered the store, the entry way was lined with Apple employees in blue and orange shirts cheering and clapping loudly! The staff handed out the t-shirts which were in small boxes (no size indicated–turns out most or all were XL) and high-fived the guests as they entered through the area which could be described as like running the gauntlet. I did not spend much time actually exploring each floor because of the number of people and congestion; that will be for another day. I did sit down to use an iMac and write one of the updates that I sent and take some more photos. Overall, I did not spend too much time in the store exploring, but the store is definitely very impressive. It does remind me of the New York Fifth Avenue store, but significantly larger. Every time I have been in the Fifth Avenue store it has seemed very busy and packed, and this new store even on opening day with the large number of people did not give me that impression. As I was leaving the employees were continuing to cheer and hand out t-shirts. Later, I had dinner at a nearby outside restaurant, and I continued to see people passing by holding the box containing the t-shirt. Several Apple employees assisted with taking down “no parking” signage and moving the barricades. I saw one person carrying a newly purchased MacBook and one person carrying a newly purchased iMac. Walking past the store on my way back to my car at nearly 10 p.m., the line was gone but the employees continued to cheer and high-five as guests entered the store. Overall, very impressive all around! I’ll be back sometime soon to spend more time in the store and buy my 3G iPhone. Our volunteer correspondent for theiLife, Adam Epstein, covered the opening of yesterdays Boston Store opening. Below is a gallery of photos he took, and a video from inside the store during the opening. The detailed story from Adam is coming soon. You can read the liveblog here; and more about the new Boylston Street store here. Photo gallery after the jump!